A Quiet Place I just reviewed another horror movie, Winchester earlier this week. It was dreadful. 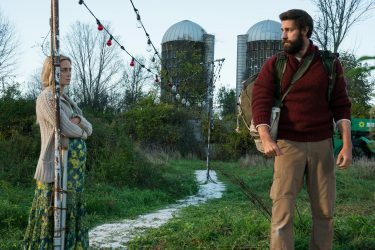 This week’s movie was a horror/thriller orchestrated by John Krasinski, who also played a lead role alongside his real world wife Emily Blunt. Like I stated in another review, horror is not my movie genre of choice. If Get Out had me glued to my seat, A Quiet Place had me running in place like the family hound having his own private nightmare. This movie…this movie was riveting. It is the best horror/thriller movie since Alien and is also one of the most ambitious since the movie was created virtually without sound. A close-knit family was trying to survive in a world that had been invaded and decimated by horrific and violent aliens. These nightmares were totally blind, but keyed in on sound, and immediately attacked and ripped to shreds anything that made any distinctive sound . The Abbott family had survived for well over a year by keeping quiet and adapting, aided by being fluent in sign language because their adolescent daughter (Millicent Simmonds) was deaf. Most of the film took place as a flash forward, a year after their youngest family member had been killed by one of the monsters due to a very poor choice made by the daughter. I am avoiding *Spoilers* as much as possible in this review. I encourage everyone to just go see this movie. The subtle but impressive modifications that must be made to everyday life, just for basic survival, were amazing. Ultimately, this film was about relationships and a father that went to incredible lengths to protect his family. Sure, we saw the monsters eventually, but like Alien, it was what we saw (and not heard), in our mind’s eye that made this film so unbearably tense. Krasinski’s craft in this movie was a work of art, a beautiful effort told with care and compassion. He immediately locked down the audience for a spellbinding 90 minutes. Every creak, every gasp and every pin-drop was nerve-shattering. A painfully intense 10 minute stretch in the film totally wrecked me. A Quiet Place did not have the usual asinine Hollywood contrivances or spoon-fed plot thrusts, but it did invoke visceral fear by mere competent storytelling. Every single moment of this film vise-gripped the audience, as danger lurked around every corner, with an infinite number of shoes to be dropped. The acting was stunning, especially by Emily Blunt who had an impossible burden to bear, and to bear alone with unspeakable horror and danger only a breath away. Millicent Simmonds, however, really stole the show as the brooding and ironically deaf teenager who was painfully aware of her role in the unfortunate death of her younger brother. There was also much attention to detail, with subtle bread crumbs dropped for the audience to digest along the inevitable path of terror. Like I mentioned earlier, the movie was almost totally without sound, but when the sound did come it was devastating. O.K, this film was not without flaws, but earned the right to every one of them. There were a few plot holes and the usual Why’d they do that! moments and the broad-based hints dropped to make sure even the most dense audience members could figure out what was going on. The ending could have been viewed as unfulfilling, but I can certainly live with it and it left the door wide open for a sequel. I guess the biggest head-scratcher for most people was the *MILD SPOILER ALERT* familial situation with the mother. I think that this was an essential element in the film. It showed the resilience of the humans who had survived the initial slaughter. The urge to survive and pass on your DNA is strong and ESSENTIAL. To not reproduce is to totally abdicate to survival pressures, no matter how extreme. 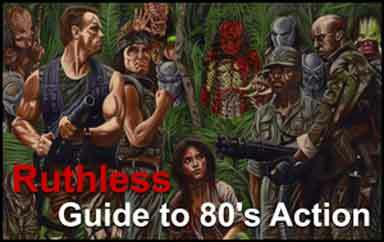 Without these survival traits, humans would not even be around to be in this movie. A Quiet Place is one of the best movies of 2018. Be advised that you will not want to go into the theater with noisy popcorn with this one. It is one of the most gripping and intense movies that I have ever had the pleasure of seeing. 9.5/10.0 With the Goatesian Seal Of Approval for Horror/Thriller movies.